The LEGO® Education SPIKE™ Prime Set is the go-to STEAM learning tool for grade 6-8 students. Combining colorful LEGO building elements, easy-to-use hardware, and an intuitive drag-and-drop coding language based on Scratch, SPIKE Prime continuously engages students through playful learning activities to think critically and solve complex problems, regardless of their learning level. From easy-entry projects to limitless creative design possibilities, SPIKE Prime helps students learn the essential STEAM and 21st century skills needed to become the innovative minds of tomorrow... while having fun! The heart of the SPIKE Prime system is the programmable Hub. Make the purchase now and make sure you are the first to enjoy it, the initial units are limited. It will be sent on August 1, 2019. This advanced yet simple-to-use, brick-shaped device features 6 input/output ports, 5x5 light matrix, Bluetooth connectivity, a speaker, 6-axis gyro and a rechargeable battery. The SPIKE Prime Set also includes highly accurate motors and sensors that, together with a large variety of colorful LEGO building elements, let students design and build fun robots, dynamic devices and other interactive models. Many attachment points on the Hub, motors and sensors plus new, large building elements means students spend less time building and more time learning. The durable storage box and 2 sorting trays also means time spent setting up and clearing away is kept to a minimum, while the smaller trays are ideal when desk space is limited. The intuitive coding environment for tablets and computers takes the best elements from the popular coding language based on Scratch, creating a system that teachers and students will love. In addition to Getting Started Material, the app comes with 3 unit plans of curriculum-aligned STEAM content focusing on Engineering and Computer Science. Designed for students grades 6-8 and optimized for 45-minute lessons, these units accelerate STEAM learning by consistently engaging students to think critically and to solve complex problems, regardless of their learning level. Comprehensive online lesson plans with a wealth of accessible, interactive support material gives teachers everything they need to deliver lessons with confidence, whatever their previous experience. 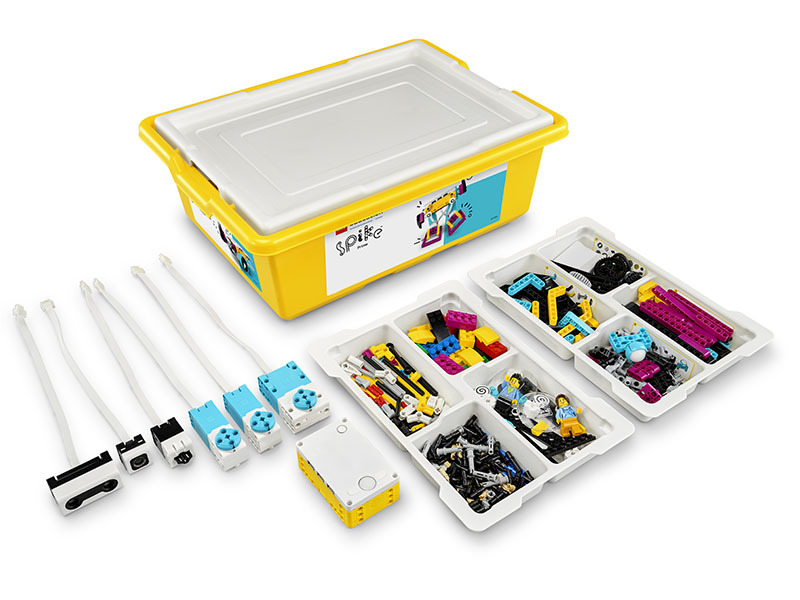 • Sturdy storage box with sorting trays, programmable Hub, Distance Sensor, Force Sensor, Color Sensor, Large Motor, 2 Medium Motors and over 500 appealing LEGO® Technic™ elements in a fresh color palette. • Programmable Hub features a 5x5 light matrix, 6 input/output ports, integrated 6-axis gyro, speaker, Bluetooth connectivity and rechargeable battery. • The drag-and-drop coding environment for tablets and computers is rooted in the popular coding language based on Scratch used by millions of children around the world. • Engage students with 3 STEAM unit plans for grades 6-8 focused on Engineering and Computer Science, linked to curriculum standards, and mostly optimized for 45-minute sessions. Includes comprehensive online lesson plans and teacher support. • Apply engineering design skills at each step of the design process. • Develop efficient problem-solving and coding skills through decomposition of problems and algorithmic thinking. • Design projects that combine hardware and software components to collect and exchange data. • Work with variables, data arrays and cloud data.